Order books open for the Alfa Romeo 4C Spider | What Car? The Alfa Romeo 4C Spider is now available to order, with deliveries expected to start later this summer. The new two-seat 4C Spider roadster has now gone on sale after being revealed earlier this year for the first time at the Geneva motor show. The removable roof will initially be available as a soft, stowable canvas arrangement – as hinted at on the concept. However, an optional carbonfibre hard-top will be available after UK sales begin, according to Alfa officials. The 4C Spider also receives a carbonfibre panel that covers the rollover bar behind the cabin, bespoke single-lens headlights and a new range of alloys – 17-inch versions up front and 18-inch wheels at the rear as standard. The 4C Spider has a carbonfibre windscreen frame that is bonded and bolted to its carbonfibre monocoque chassis in the quest to keep excess weight down while retaining a similar level of rigidity to the 4C coupe. The glass for both the windscreen and side windows is 10% thinner than on the 4C, too. Power comes from the same mid-mounted turbocharged 1.7-litre four-cylinder engine used by the 4C coupe, which delivers 237bhp. 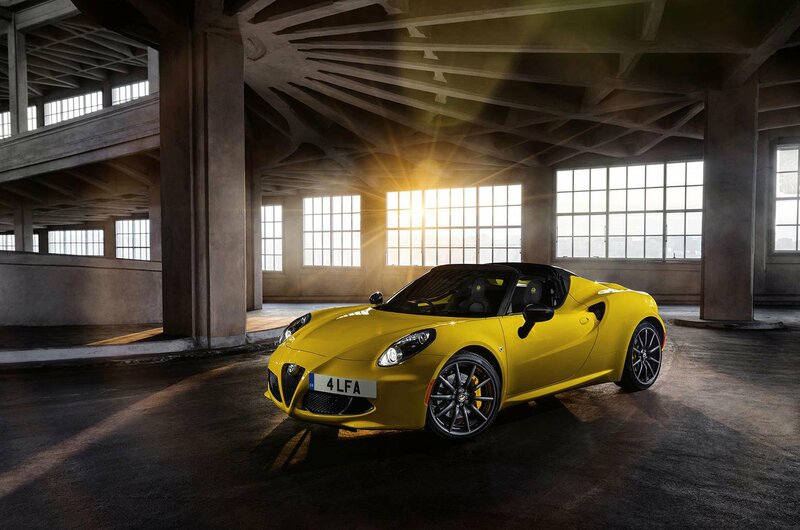 Alfa Romeo claims the 4C Spider is capable of accelerating from 0-62mph in just 4.5sec - the same as the coupe. There is no official information on the fuel economy and CO2 figures, but it is expected to match the hardtop equivalent, which emits 157g/km and averages 41.5mpg. The 4C Spider improves on the equipment levels of the coupe, with an upgraded stereo, more leather interior trim on the glovebox, luxury floor mats and a bespoke car cover. It also comes with a carbonfibre windscreen frame and more wheel options. The headlights are closer to the 4C concept's than the original coupe in that they have a plastic cover rather than a series of open spotlights. The Spider is also available with cruise control and rear parking sensors as no-cost options. Alongside the standard and racing exhausts already available on the 4C, the 4C Spider also comes with an optional lightweight Akrapovic exhaust. The Spider comes with Alfa Romeo’s six-speed dual-clutch automatic gearbox. It offers the driver the choice of four different driving modes: All Weather, Natural, Dynamic and Race – the latter allowing the engagement of a launch control system for maximum off-the-line acceleration. How much will the 4C Spider cost? There is only one version of the 4C Spider offered, and it costs from £59,500, a £8000 premium over the coupe. Unlikely. Our Target Price research shows that there is zero discount to be had on a coupe 4C, something we'd expect to be repeated on the more desirable Spider. The 4C is a stripped-out performance car devoid of many creature comforts. The Porsche Boxster, a five-star car, is better to drive than the standard 4C coupe and more usable everyday. Read the Alfa Romeo 4C coupe review here.